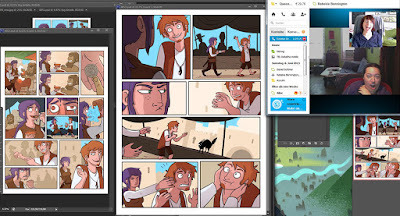 To celebrate the German publication of Pepper-Chronicles, I am planing on a series of making-of posts about this comic here on my blog in the upcoming weeks. Get more info about it here: pepperchronicles.com - considering the English edition, we are still working on that. Oh, and if you speak German, you order it for cheap moneys (10 Euros cheaper) at our indiegogo until end of June. How do you handle an international project like this with two project partners in a different time zone over the course of five years? The answer for me was Facebook. We used a private group to get a lot of the coordinating work done. This, plus a couple of skype-meetings every month. And let’s not forget the stubborn persistence I tortured my project partners with over the course of five years. 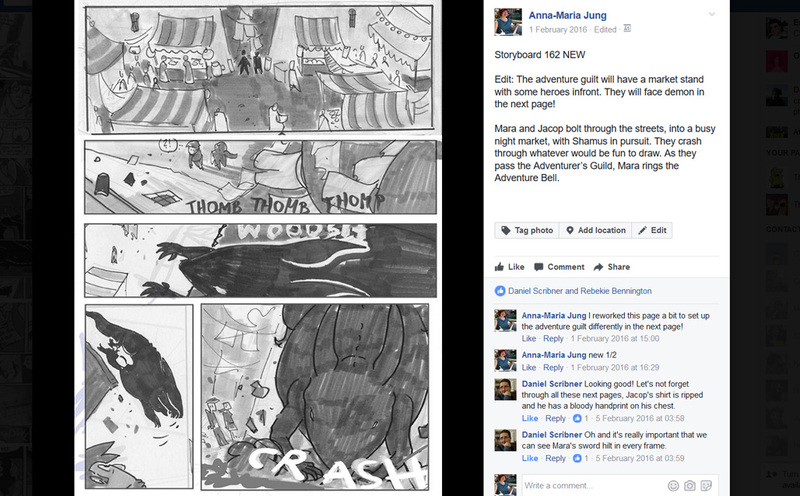 The Facebook Group was an amazing tool in coordinating between script, storyboards, layouts, inks and color. On each stage, we used the comment section to suggest changes, thoughts, ideas and spot mistakes. Each stage of a page usually had an album-folder (“Storyboards”, “Layouts”, etc.) and if I wanted Rabekie or Dan to review them, I would tag them or e-mail them about the new additions in our group. The FB-group was very useful, but it also became quite challenging to keep track of all the folders, and the vast number of image-files. Over the years, keeping track of everything sort of became my major job, so after some time Rebekie just called me “art-director”. It truly challenged me to stay in control of everything sometimes, but honestly: Without the FB-group it would have been a near-to-impossible task. The skype meetings started when I left for Austria in 2012. The most useful aspect of them was to stay in touch, keep the project running and fresh, but also to talk trough bulks of the script and spot inconsistencies, suggest changes or just pat Dan on the shoulder for doing a great job. Rebekie and I sometimes used those meeting to just work on the comic on the same time. Sometimes I would use the screen-share-function in Skype to show her things in Photoshop, and vice-versa. All in all: It took a lot of work to keep it together over the past five + years. Honestly: I had to revive the project a couple of times. I had to plea and to beg sometimes. But in the end, Rebekie and Dan always delivered fantastic work.